You’d probably say California if asked to name the best place in the world to find top programmer talent. Some compelling data that shows that’s not the case. Stack Overflow is a really interesting source of data on the skill level of different coders around the world. Users of the platform vote up or down answers to questions, and based on the answers users provide and the rankings of their fellow users, Stack Overflow literally stack ranks its members. These rankings are by and large impartial, determined by the crowd and based solely on the perceived quality of answers to coding and systems questions. To find out where the world’s best coders are concentrated, we analyzed the profiles of the top 14,898 users in Stack Overflow — that is, all the members who have a reputation of 5,000 or more, which is considered an extremely high level of achievement. Here’s what we found. While London has a solid reputation in tech, it’s not usually considered on par with San Francisco and the Bay Area in terms of tech talent. Yet London has the highest number of top Stack Overflow members, clocking in with 394 that have a reputation over 5,000. 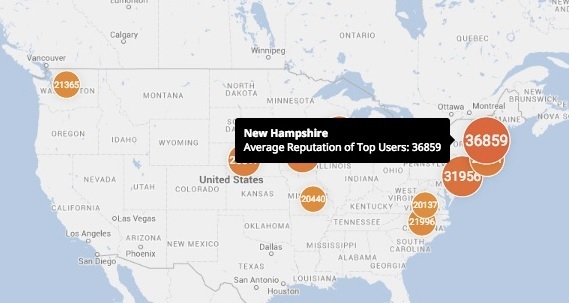 New York City also comes in before San Francisco, with 270 and 269 users respectively. Still, San Francisco has only one-tenth the population of London and New York, so on a per capita basis, the City by the Bay does come out ahead. London, though, is well ahead of New York even though the two megacities have roughly the same number of inhabitants. The upshot? If you want to find a coding unicorn among the masses of programmers, SF remains a good bet, followed by London. (Caveat: Stack Overflow users self-declare their location, so we’re relying on their word here). If we look at countries rather than cities, we get another very interesting picture. New Zealand and Sweden win the ranking of nations with the most top-ranked users per capita (that’s assuming we exclude countries with less than 10 top-ranked users such as tiny San Marino). The UK, Israel, and Australia round out the list of top 5 countries. The United States doesn’t even make the top 10. That’s right. The tech behemoth is a weakling when it comes to coding talent. world. 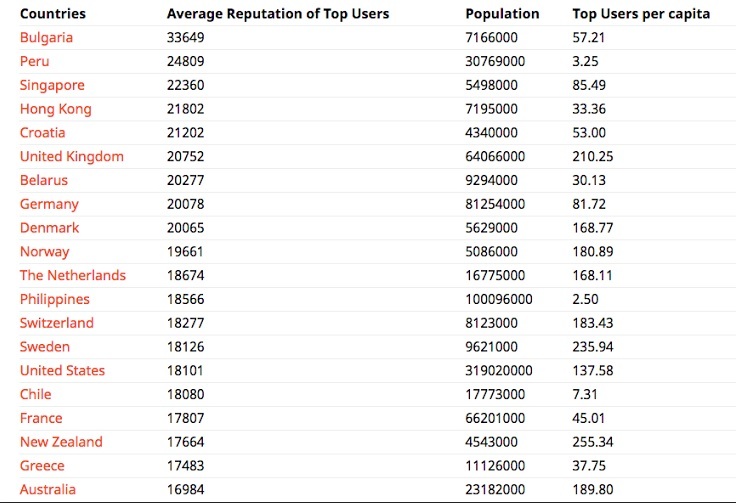 Here’s how: If we sum up the reputation of Stack Overflow’s top users by country, and divide it by the number of top users, we get each county’s “average reputation”. Bulgaria has “only” 40 users with a 5,000+ reputation, but their total score makes it the country with the highest average reputation in the world. In other words, if you are top user in Bulgaria, chances are you a total Stack Overflow rockstar. If we focus in just on the U.S., we get another interesting insight. California surprisingly doesn’t take the top spot in per capita numbers of top-notch Stack Overflow participants. In fact, California comes in fifth on this basis, behind Washington, D.C., Washington State, Massachusetts, and Oregon. How about the quality of California’s top Stack Overflow talent? According to their peers’ votes, California coders perform well but lag far behind other states such as New Hampshire, Iowa, and New Jersey. 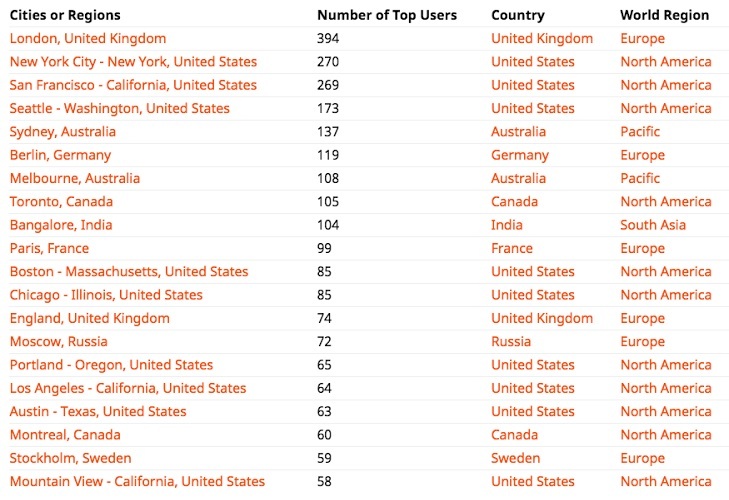 In fact, over a dozen states have higher average user rankings than California’s top Stack Overflow crew. The upshot of all this? California is not an especially great place for code talent. Many other locales, where software engineers often earn less money, are ranked much more highly than the Golden State. There is an argument that San Francisco is home to an extremely high population of Stack Overflow Unicorns. But the national and global numbers also imply that there is plenty of talent elsewhere in the world. Sorry, California. Your day in the software sun may be over soon.